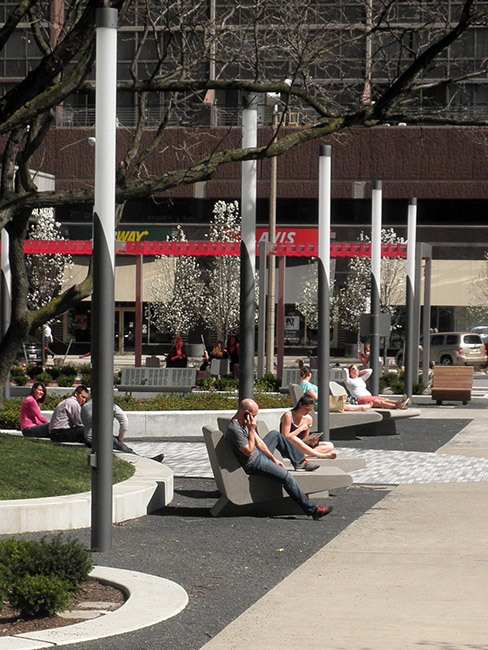 The vitality of a city can be gauged by the richness and popularity of its public spaces. 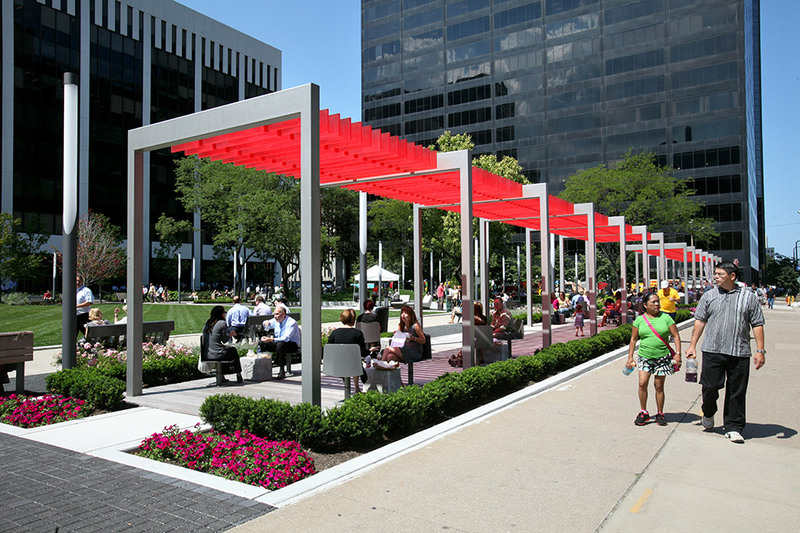 As the crossroads of our cultural, social and commercial activity, urban parks and plazas should reflect our civic values, our sense of place, and our commitment to the quality of life we have promised our citizens. 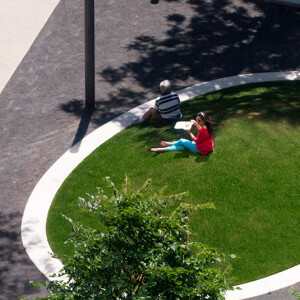 Over the years, Thomas Balsley Associates has carefully researched hundreds of these complex, multi-purpose spaces, their social and physical dynamics as well as the unique design principles and pitfalls that contribute to their success or failure. 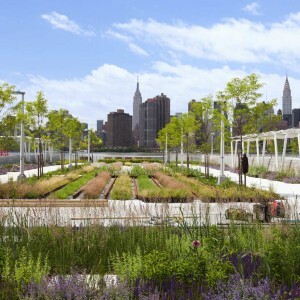 To visit our public landscapes is to experience, a 21st Century version of the Greek agora, democratic sanctuaries or common grounds that reflect our current cultural, environmental and social conscience. 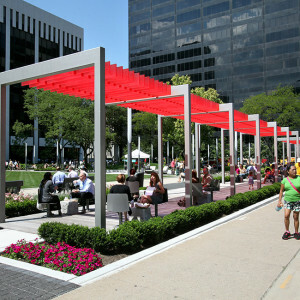 Vibrant public space has become a cross-cultural setting that celebrates its city’s spirit and future. 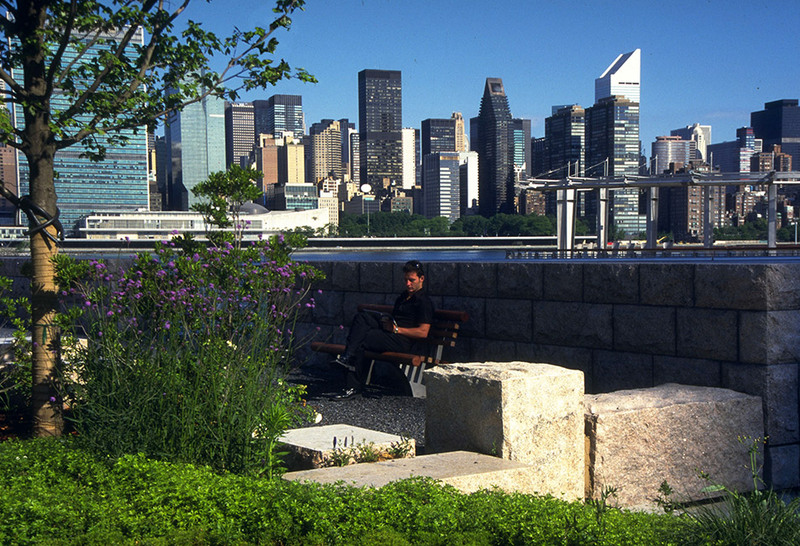 Architecture critic Herbert Muschamp in his foreword to a monograph about Thomas Balsley wrote, “The urban park is modern democracy’s greatest art form. 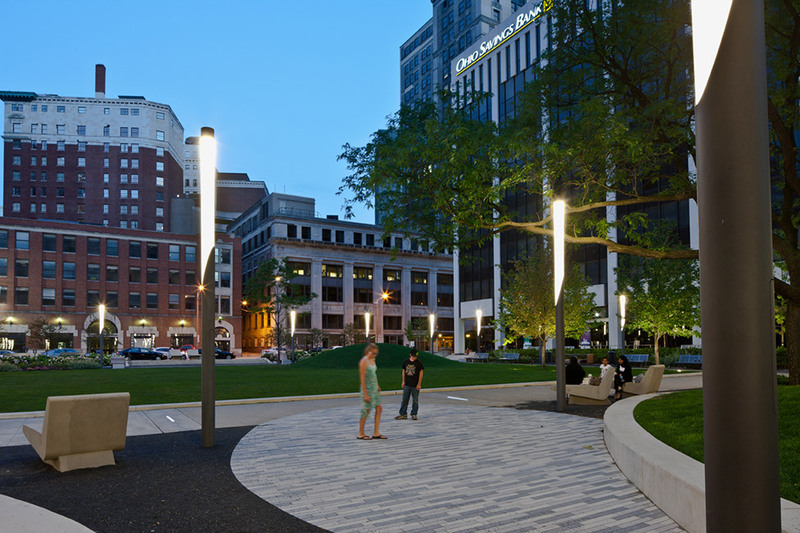 Tom Balsley practices park design as such…” The miracle of these spaces— be they parks, plazas, streetscapes or waterfronts — evolves from a bold, nuanced and inclusive design approach which we have perfected during our forty years of designing urban landscapes. 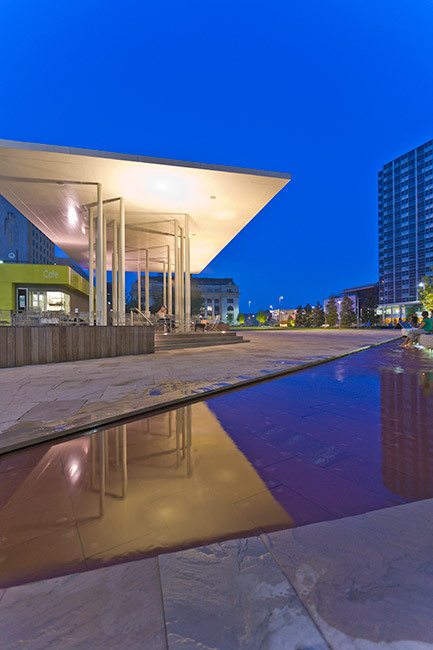 Our portfolio offers evidence of a bold and lasting vision combined with professional execution which has served to create iconic and memorable public landscapes of international recognition. 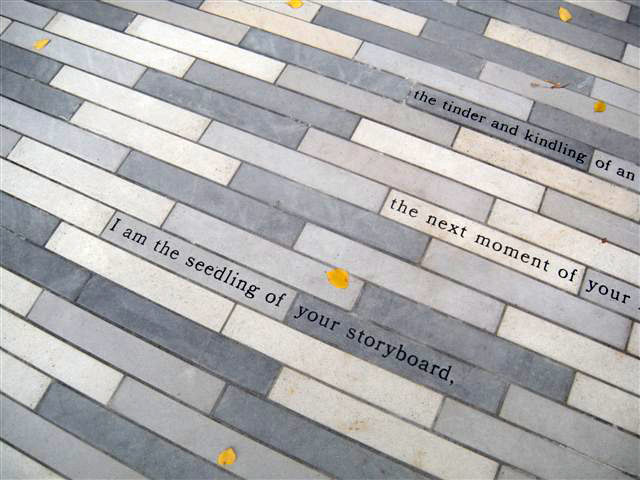 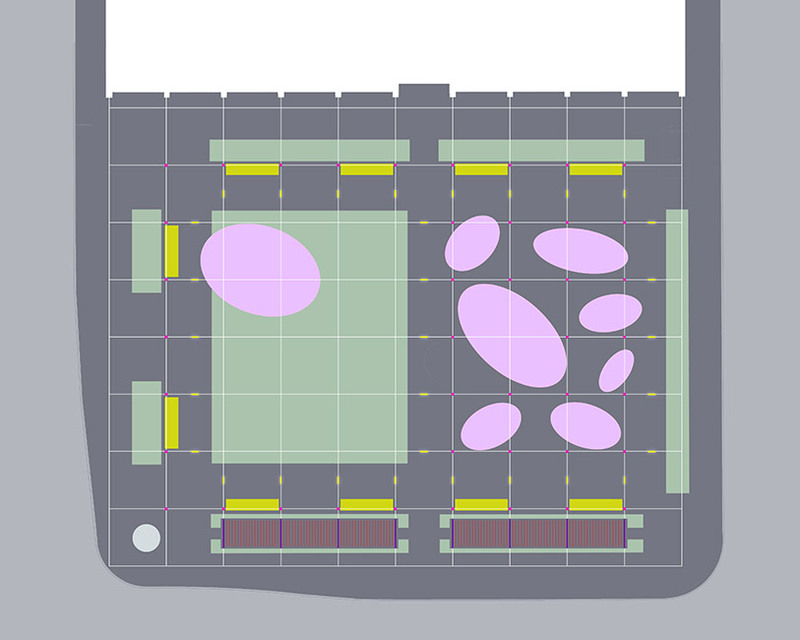 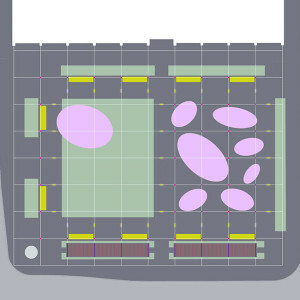 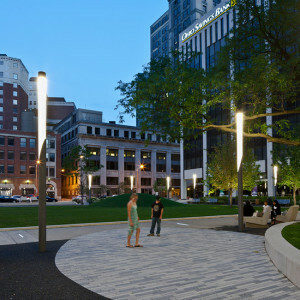 In taking on these challenges, we have changed the way many clients and our peers approach design in the public realm. 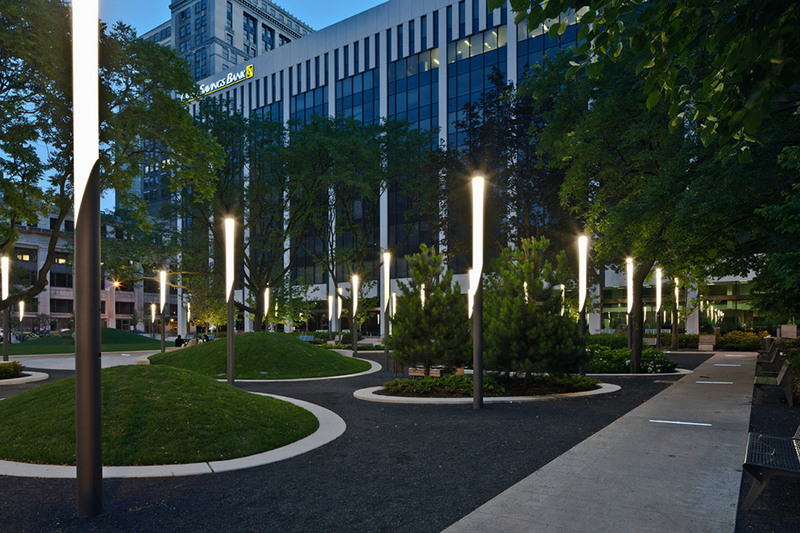 Our expertise and enthusiasm for an inclusive design process invests clients and stakeholders in the vision and long-term embrace of these spaces. 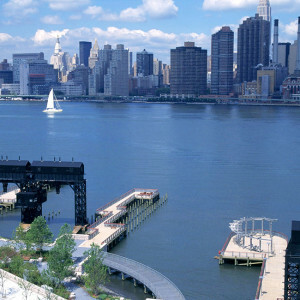 Unlike some designers, who feel that the client and community input process stifles creativity and self-expression, Thomas Balsley Associates draws upon it for inspiration and guidance as we pursue innovative responses. 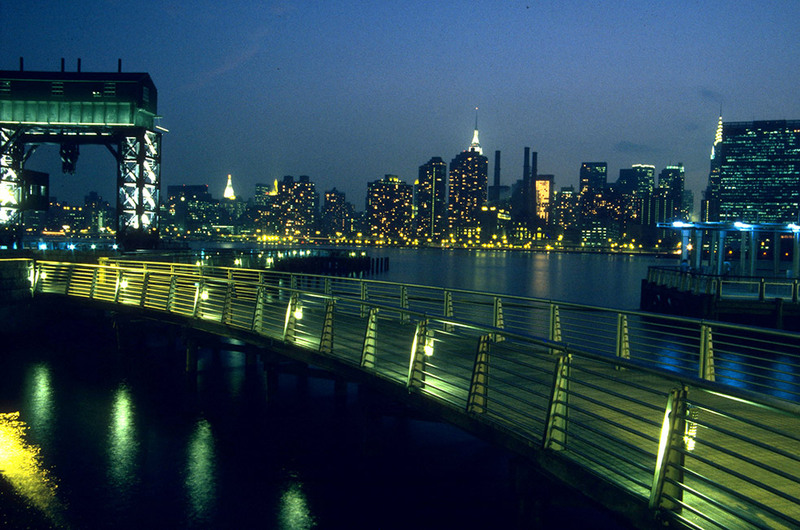 Time and again, open-minded creativity has helped us bring disparate constituencies and conflicting agendas to consensus; sometimes against seemingly insurmountable odds. 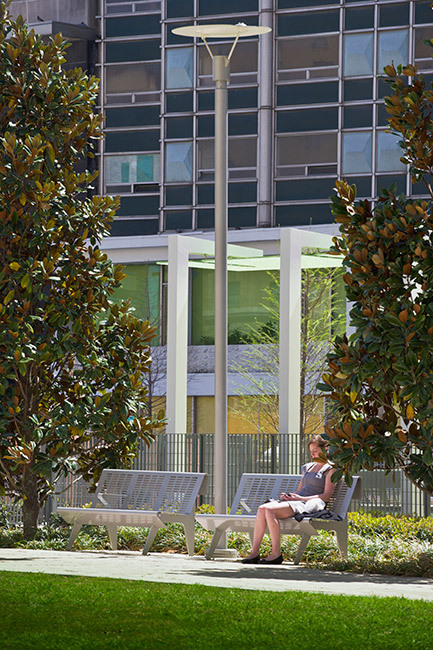 Having demonstrated our commitment to their interests, stakeholders have rewarded us with the artistic freedom to translate their goals into artistic landscapes. 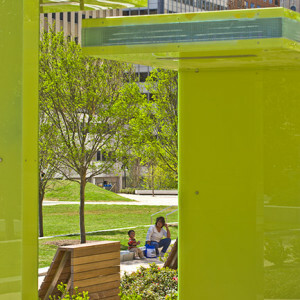 Together, we have found the courage to spark the public’s imagination with a profusion of colors, forms and public art in our public spaces. 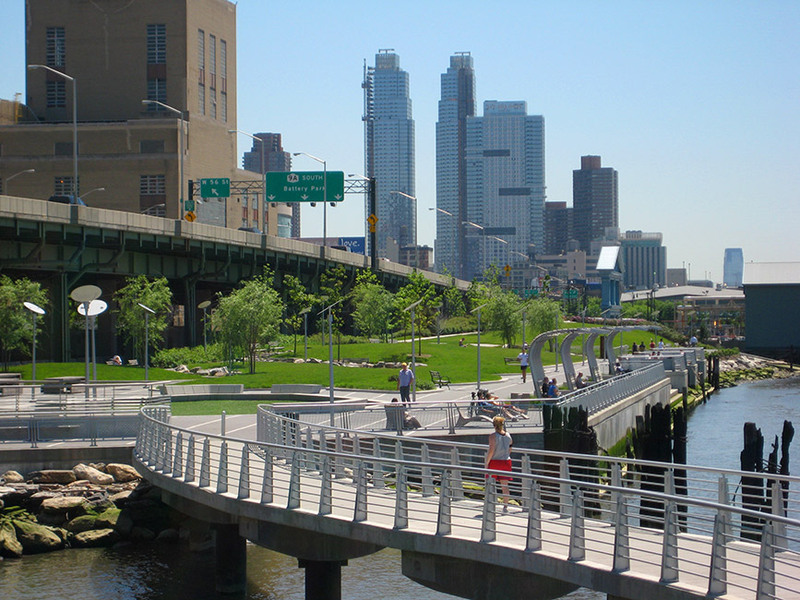 Each success leads to more trust, more freedom and, ultimately, to places that cities and clients alike can point to as symbols of their collective effort and pride. 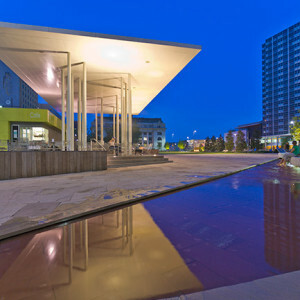 Working in urban environments is not for the faint-hearted. 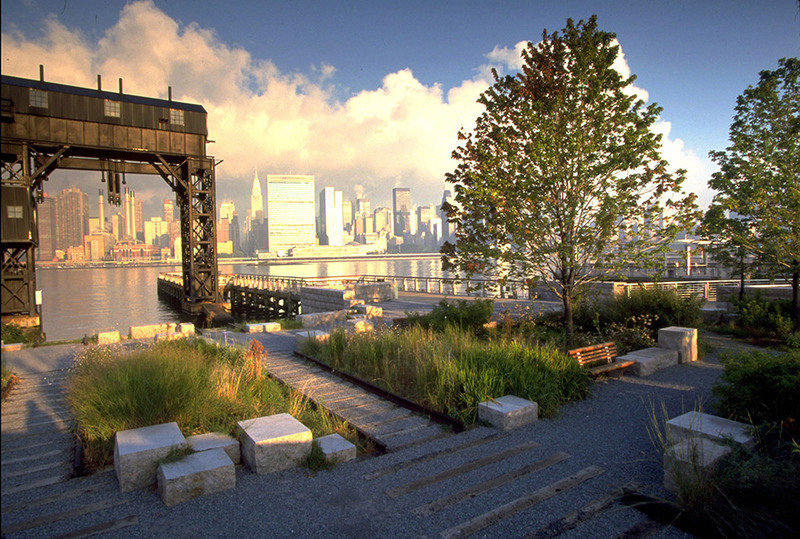 It demands an understanding of complex environmental, ecological, and social issues as well as the complex technical challenges of urban infrastructure. 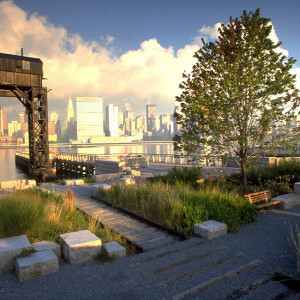 Thomas Balsley Associates, engaging with experts and stakeholder, is adept at confronting the challenges posed by urban sites and striving to create places that are socially vibrant and ecologically responsible. 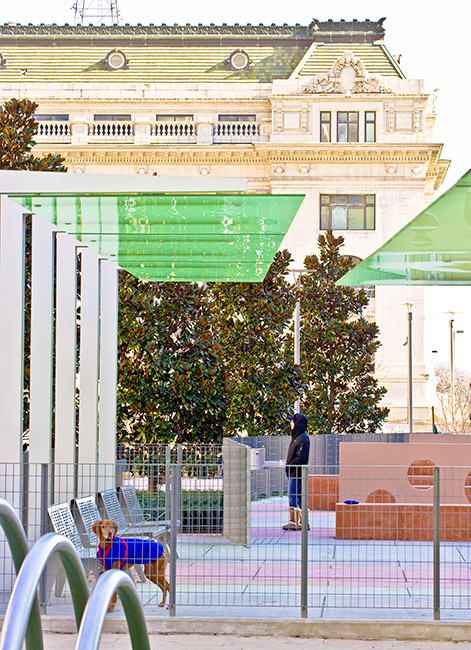 From the preservation and adaptive reuse of historic structures to implementing culturally significant programming and new design elements, we work to transform problems into design opportunities with site-specific strategies. 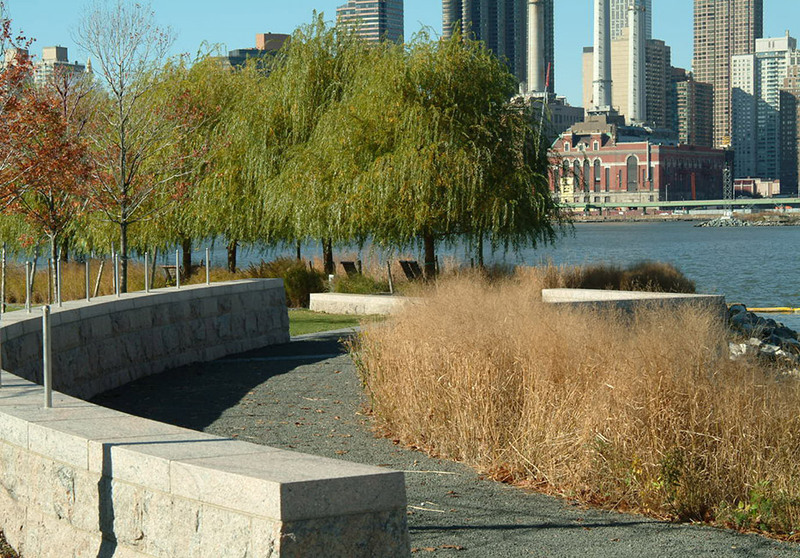 For example, the creation of bio-retention swales or the use of ￼native plantings to provide much needed habitat or water filtration strategies are just a few sources of innovative design solutions. 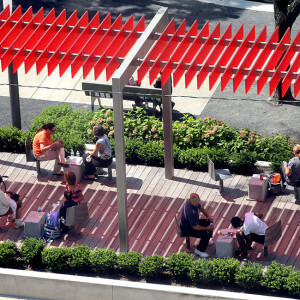 More important than the awards and critical acclaim that Thomas Balsley Associates work in public landscapes has received is the gratification a visit brings. 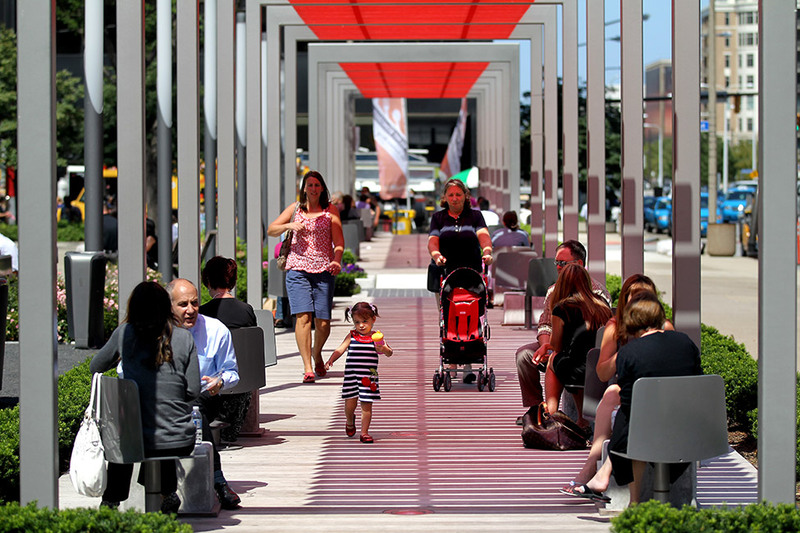 To witness a diverse population enjoying the full benefits and delights that these environments can bring is affirmation of our design principles and the hallmark by which we measure our success. 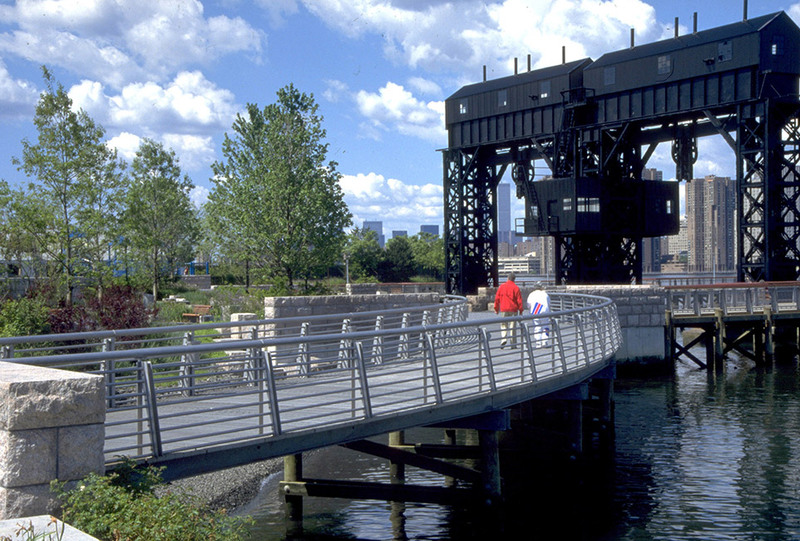 Our firm’s years of experience working with the public in the urban environment has given us a healthy respect for the powers of observation and listening, particularly as they relate to maintenance, safety, and the park management that is required to sustain these precious environments. 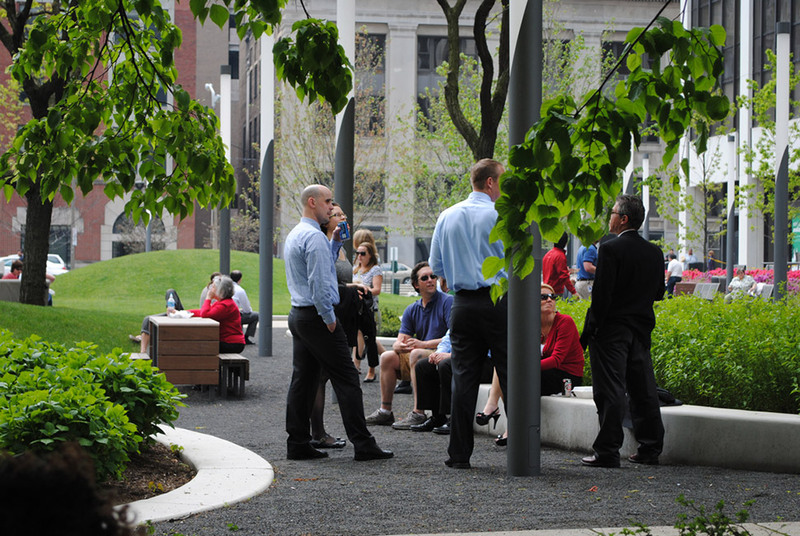 The art of listening is one of our firm’s strongest assets. 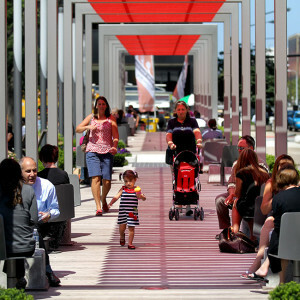 Indeed, the ability to leave one’s design ego at the door should be required of any designer working in the public realm. 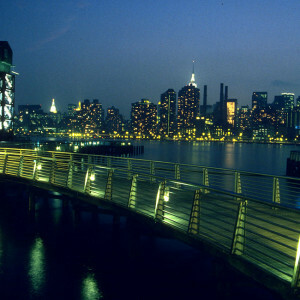 This does not mean a compromise of creativity, innovation or the pursuit of excellence; it simply means that the real needs and concerns of the stakeholders must be sorted out and absorbed as the prerequisite to all design thought. 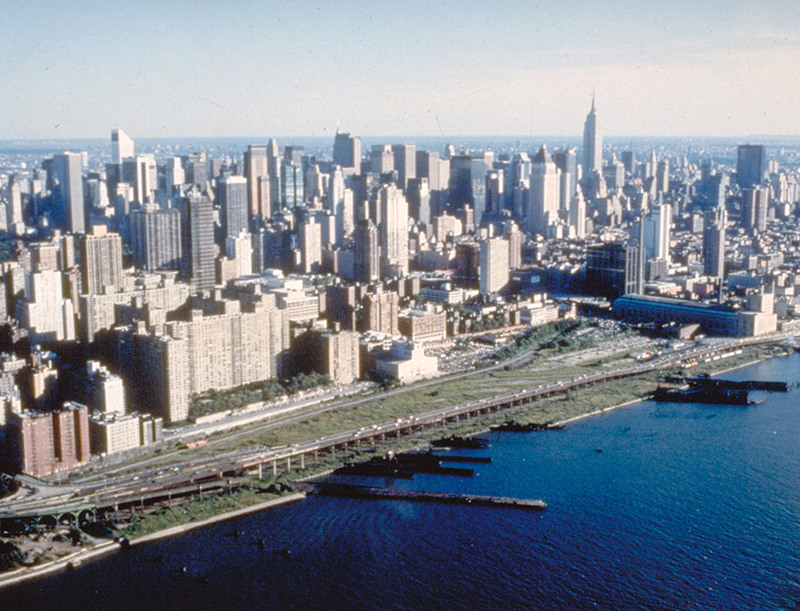 Once a working waterfront teeming with barges, tugboats, and rail cars, the Hunter’s Point shoreline of Queens slowly succumbed to the realities of the post-Industrial Age. 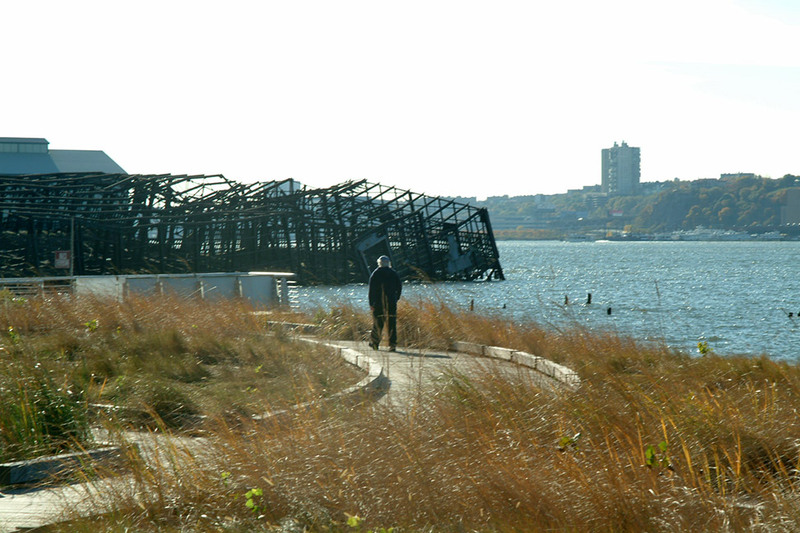 As the last rail barge headed into the sunset, this spectacular site was left to deteriorate to a point of community shame. 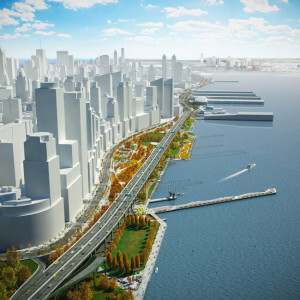 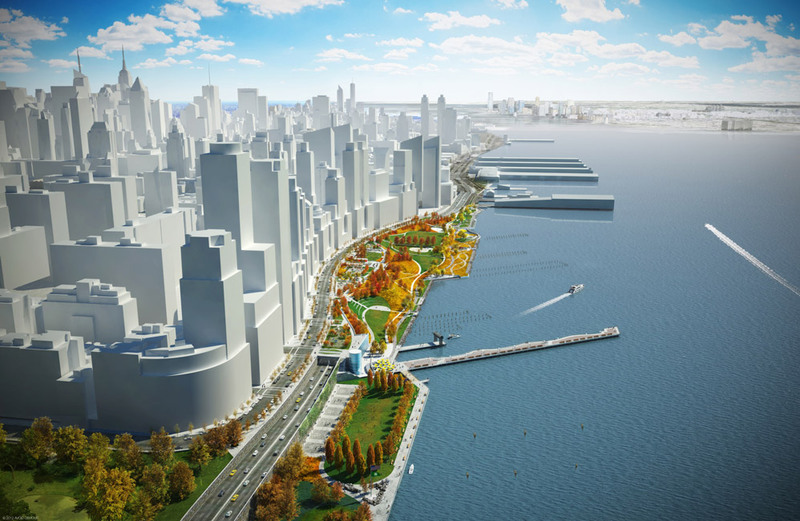 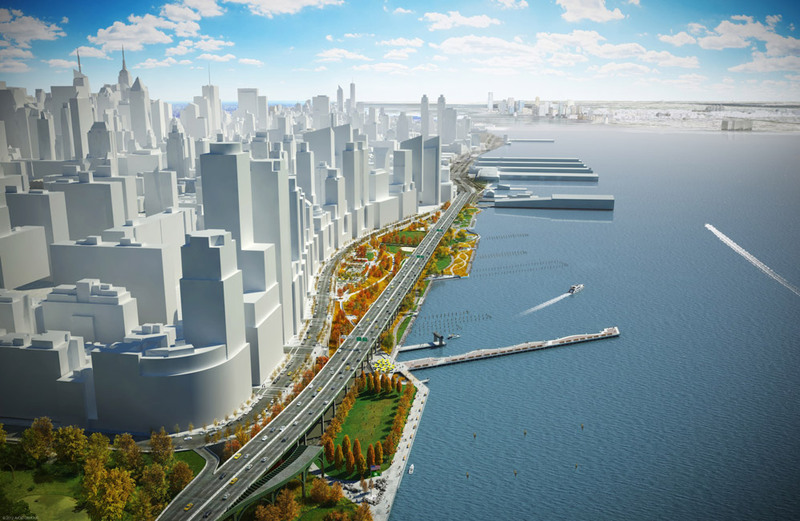 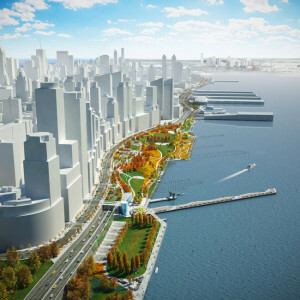 As part of the Queens West Parks Master Plan, Thomas Balsley Associates, together with Weintraub di Domenico, envisioned Gantry Plaza State Park as a place that celebrates its past, future, skyline views and the river. 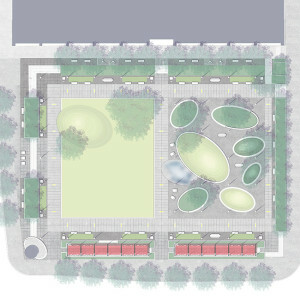 The park is divided into three areas. 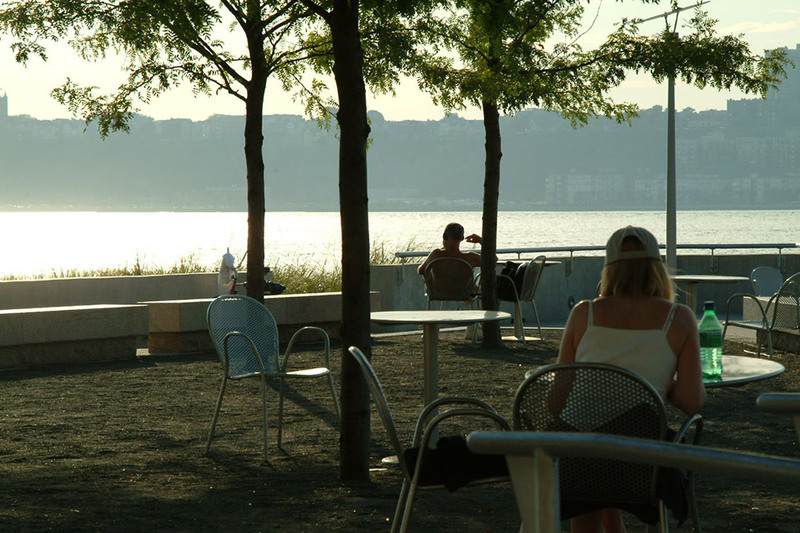 The Promontory is a great lawn with a natural shoreline edge that takes full advantage of the stunning view of the Manhattan skyline. 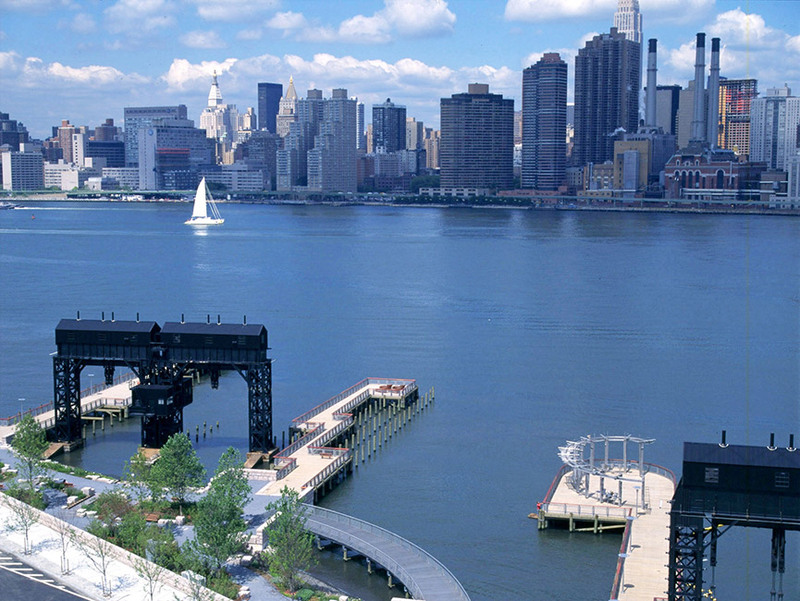 In North Gantry Plaza, the skyline is framed by restored gantries – gigantic structures that once transferred railcars onto rail barges. 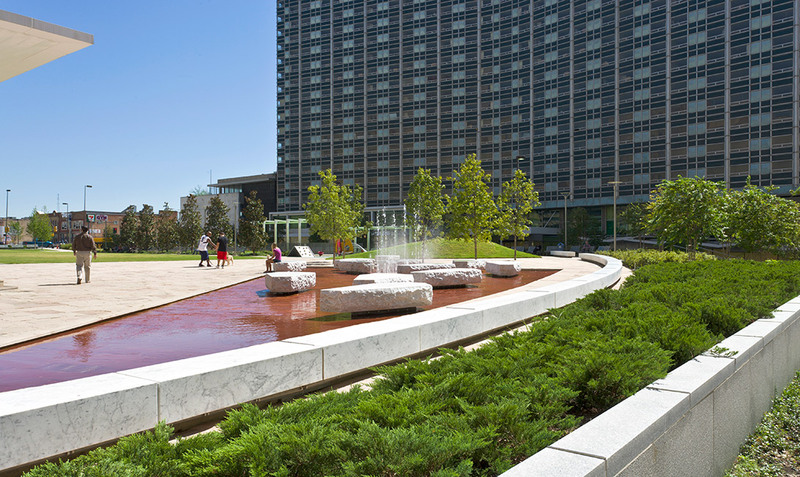 Framed by tree-shaded cafes, a fog fountain and game tables, the plaza accommodates 30,000 viewers for the 4th of July fireworks. 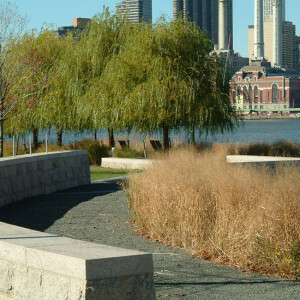 South Gantry Interpretive Garden is a contemplative space formed by two paths; here, stepping-stone blocks provide the visitor with direct access to the water and look as if they had been abandoned only yesterday. 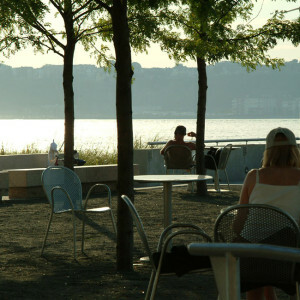 Peninsula Park offers a great lawn promontory with a natural shoreline edge. 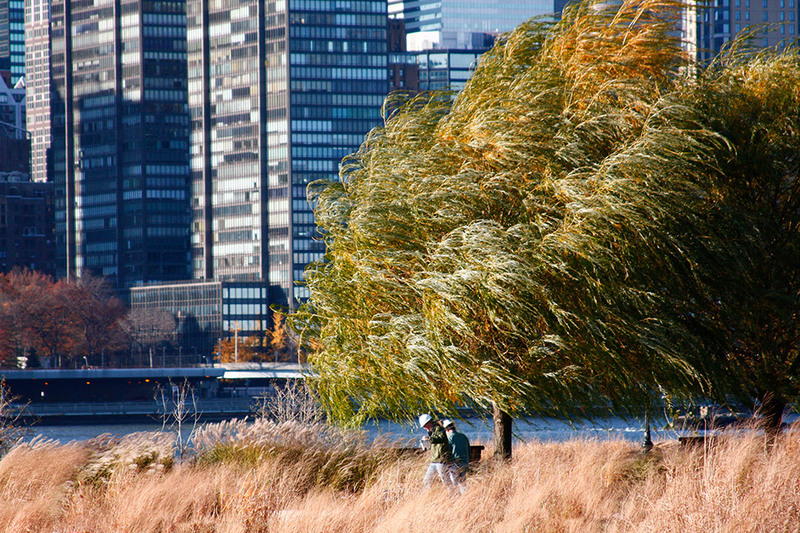 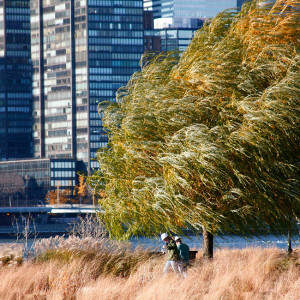 It is enhanced with willow trees and natural grasses and encourages a wide variety of passive activities, foremost of which is enjoying the stunning view of the Manhattan skyline. 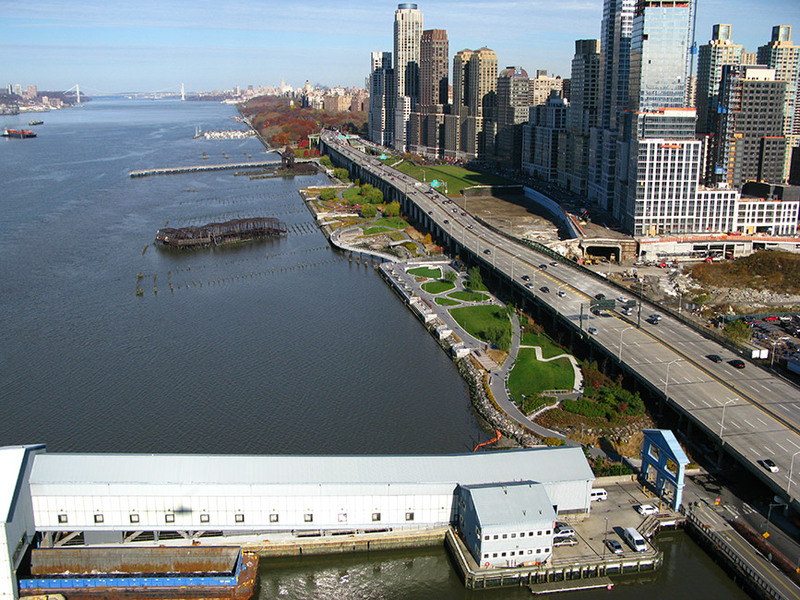 This extraordinary site was blessed with a diverse shoreline and an intact light industrial/blue collar residential neighborhood whose diversity inspired its design. 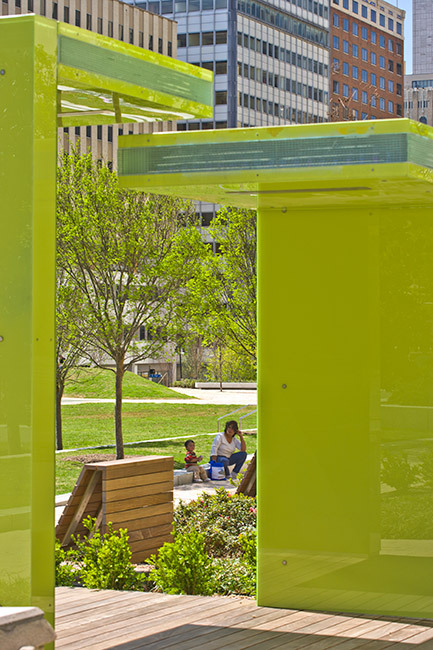 This place serves much broader social purposes by healing a once-divided community and instilling in it a strong sense of neighborhood spirit and pride. 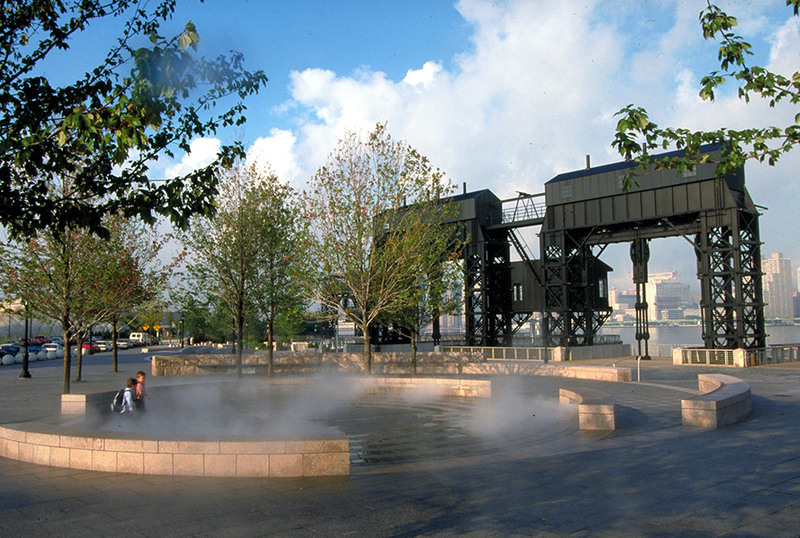 That an alliance called Friends of Gantry Plaza State Park was formed by original residents to protect the park is a testament to the power of this place. 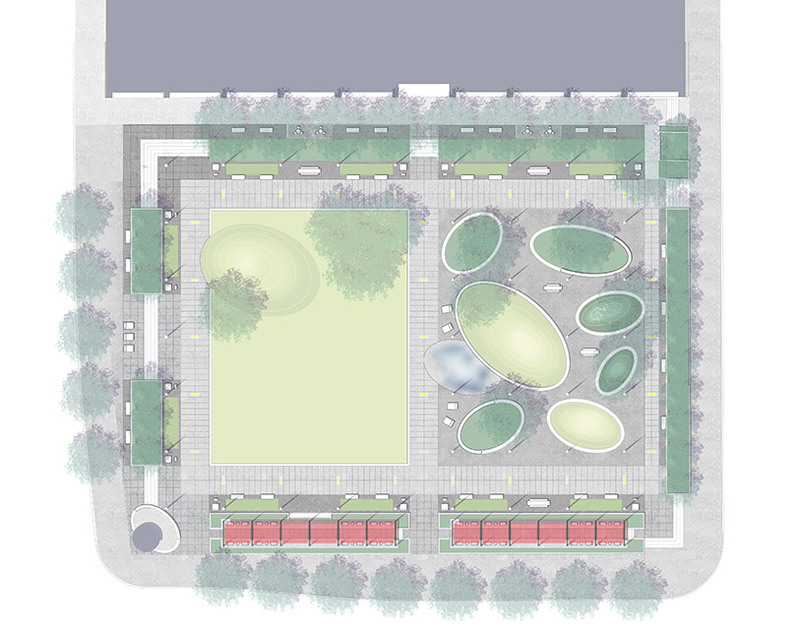 Thomas Balsley Associates was selected from an outreach to international design firms to design the first new park for the Dallas Central Business District in 50 years. 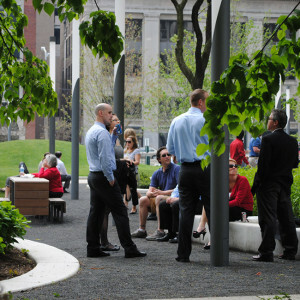 A key component in the downtown revitalization strategy, Main Street Garden Park required the razing of two city blocks of buildings and garages making way for its transformation into a vibrant public space teeming with civic life. 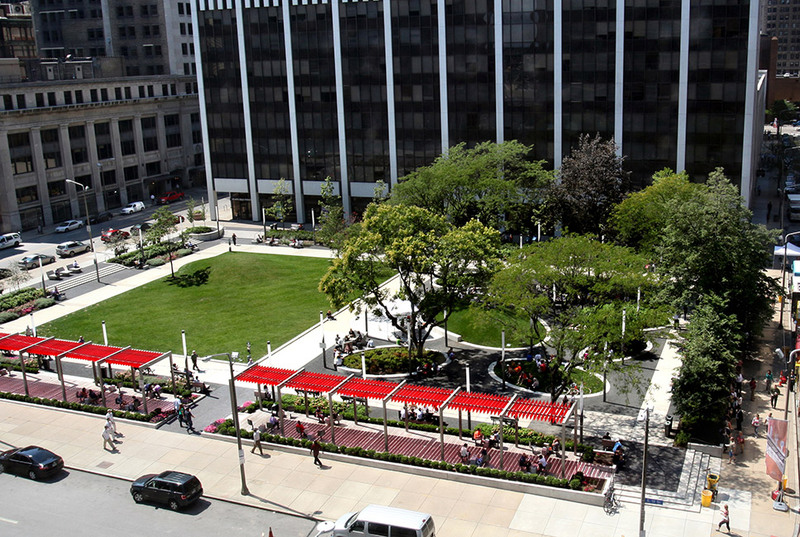 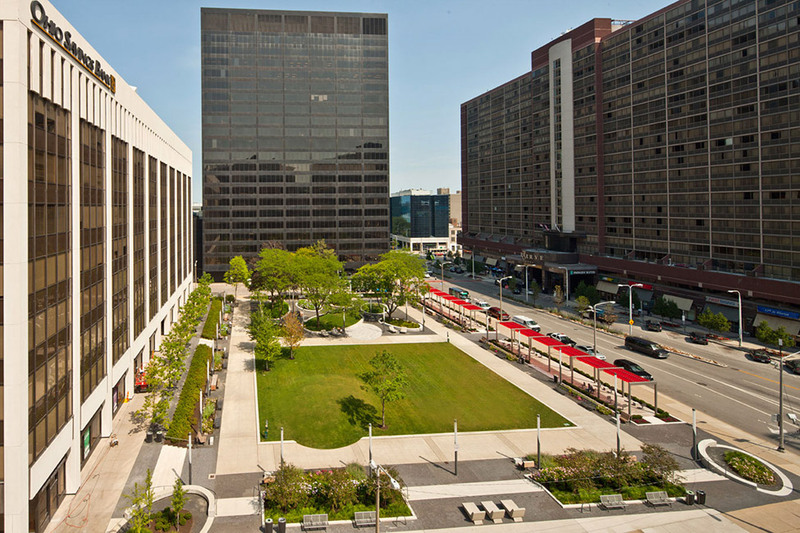 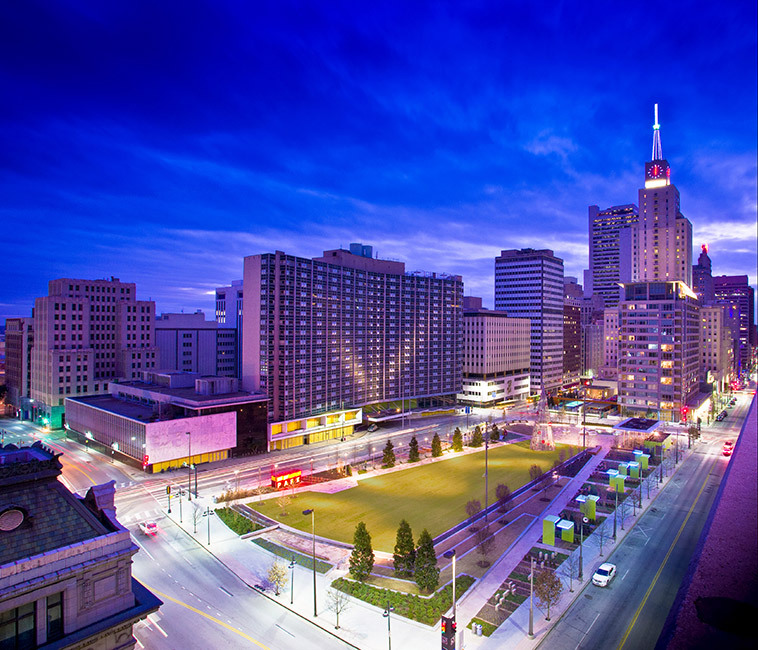 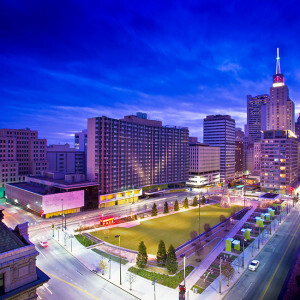 This two-acre park fosters downtown residential and commercial growth and was designed to accommodate the needs of residents in adjacent high-rise residential buildings, university students and faculty, office workers and Main Street shoppers. 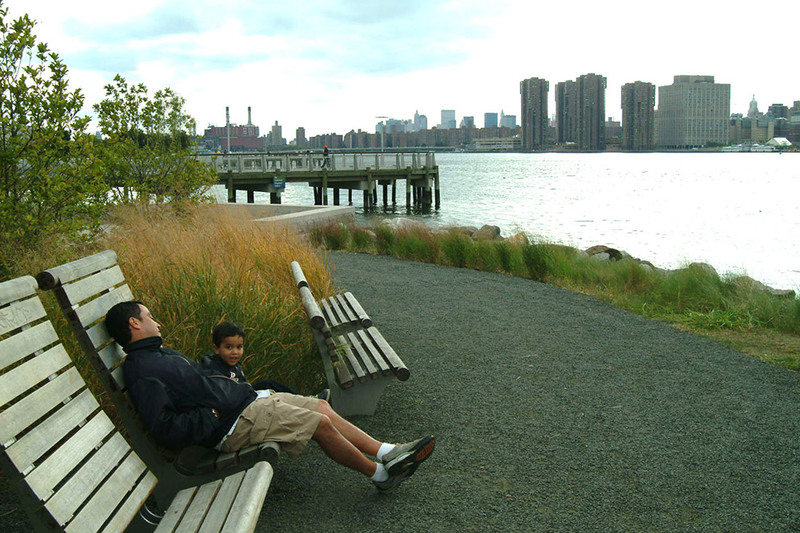 Extensive public outreach and a carefully designed program for this diverse constituency has ensured the park’s success and sustained public embrace. 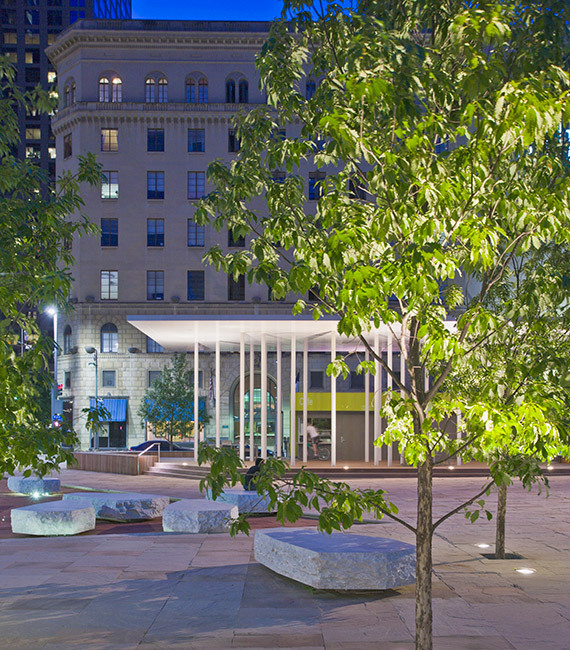 The design acknowledges adjacent architecturally significant buildings such as the Beaux Arts City Hall and Mercantile Bank Building yet strikes a dramatic 21st century design profile at this key location in Dallas’s emerging new urban core. 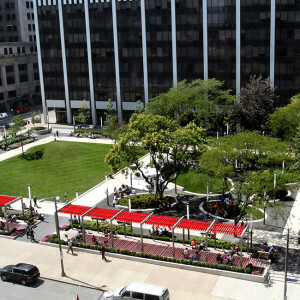 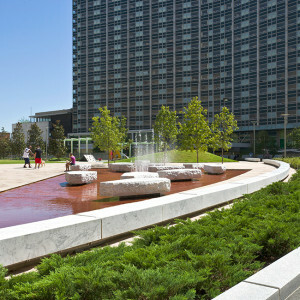 The park includes an open lawn and performance space, around which key park elements are arrayed, seating areas, tot lot, central plaza, a unique “urban stream” with marble seat slabs, a “striated” garden, an urban dog run, illuminated green glass study-room shelters, and lush plantings. 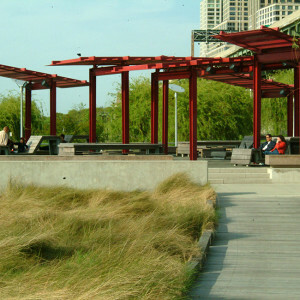 A green roof civic canopy hovers over the park pavilion and its raised cafe terrace. 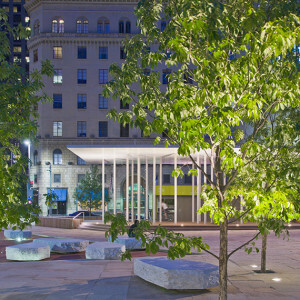 An artful light installation animates the garden room shelters and enhances the Main Street edge throughout the evening. 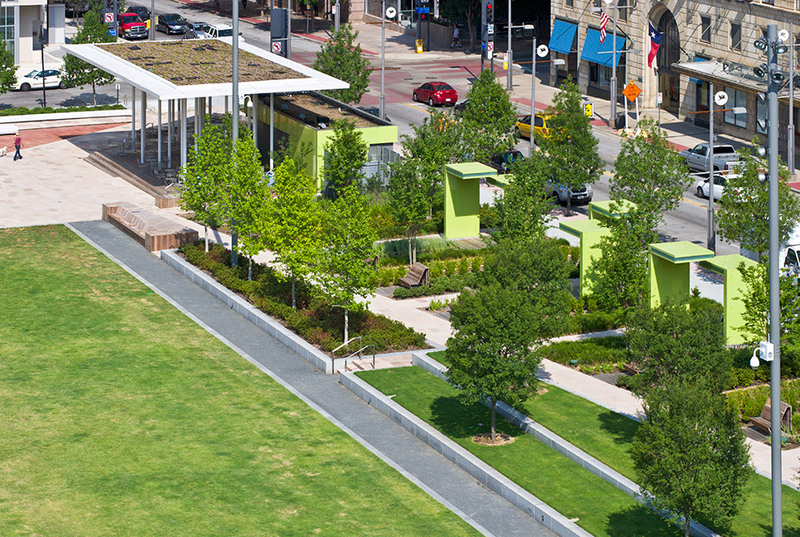 This variety of spaces, ranging from large open lawn and café terraces to fountain plazas and garden rooms will host neighborhood and civic events that, together with daily use, bring life and vitality to downtown Dallas. 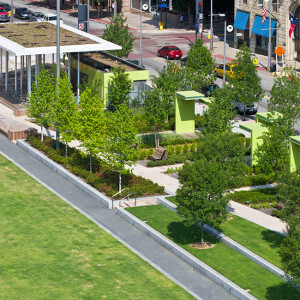 Perk Park is a one-acre greenspace in the middle of downtown that transforms a long-neglected corner of modernist architect I.M. 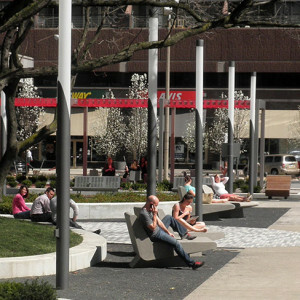 Pei’s historic 1960 master plan into a lively, welcoming urban environment for the 21st century. 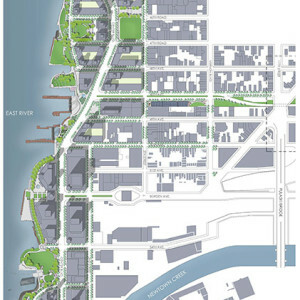 Named for former Cleveland Mayor Ralph Perk, the park is located at East 12th Street and Chester Avenue, on one of several downtown parcels bulldozed decades ago as part of Pei’s urban renewal scheme. 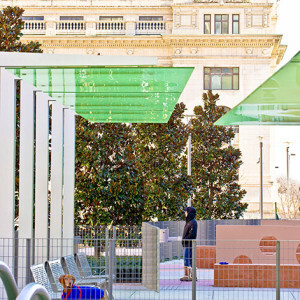 Balsley—working with the local office of Jim McKnight—was tasked first with giving the park back to its urban context, to open it up to the adjacent streets and make it feel a part of, rather than apart from, its immediate surroundings. 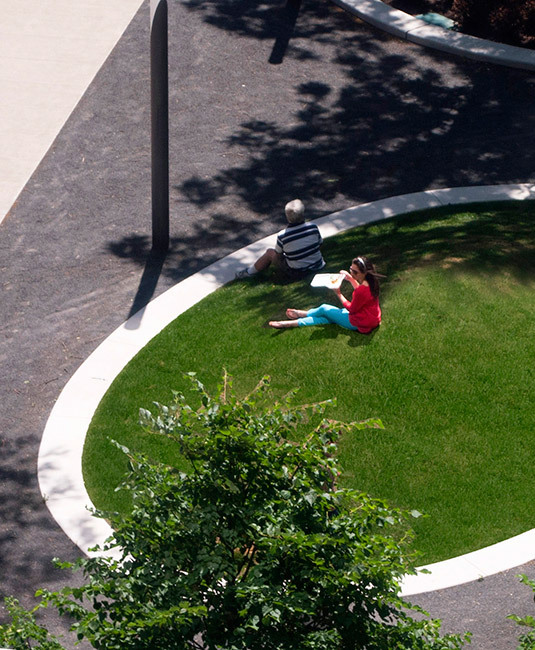 Shade trees, as well as modified versions of the original planted mounds, are preserved from the old design; but now they’re complimented by a wide-open lawn sitting atop the former central sink, punctuated by a sculptural knoll perfect for daylight lounging. 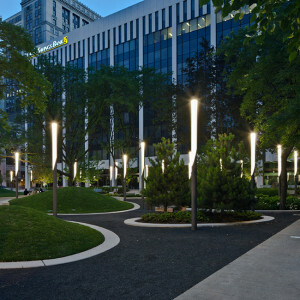 The oval mounds scattered throughout provide topographic relief, and their gentle curvilinear forms contrast with a geometric grid of 20-foot-tall light wands that echoes the rhythm of the nearby buildings while providing night-time drama. 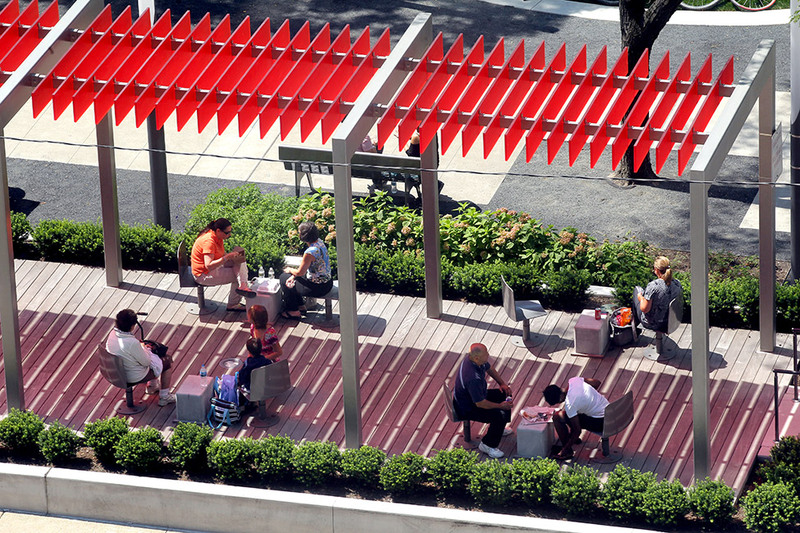 Balsley’s new Perk Park embodies the untapped potential of small urban public spaces. 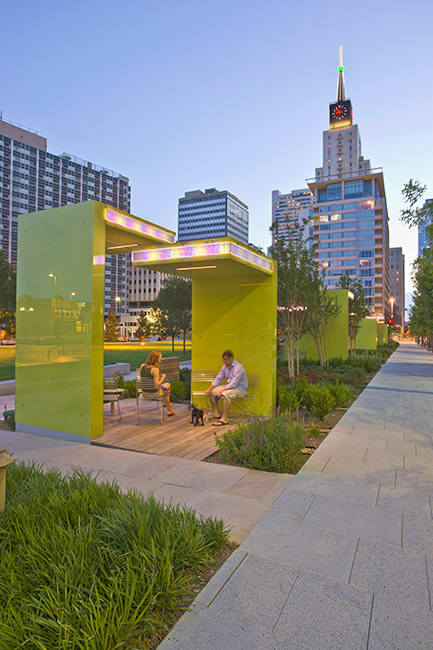 Just as they have for cities from New York to Mexico City, from Dallas to Tampa, the firm has helped transform a wasteland into common ground, a source of pride and pleasure for the whole community. 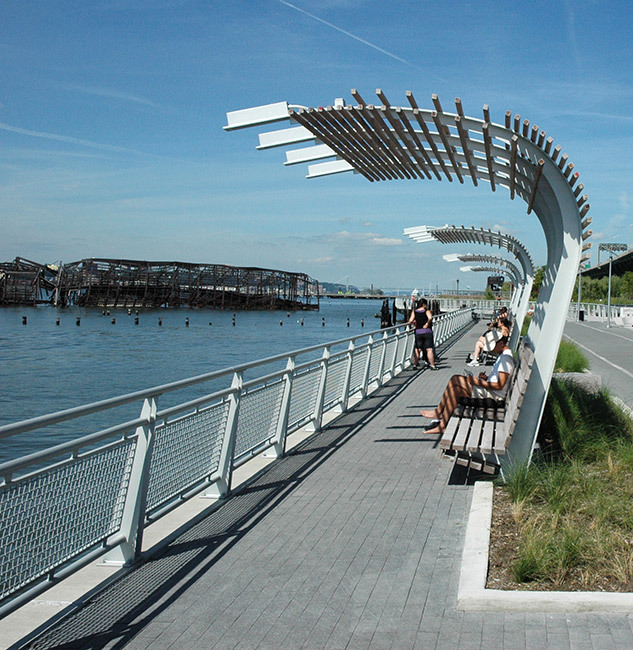 As part of an urban design collaborative with Skidmore, Owings and Merrill for this new 65 acre redevelopment, Thomas Balsley Associates led the design effort for the project’s centerpiece, a 26-acre waterfront park on the Hudson River. 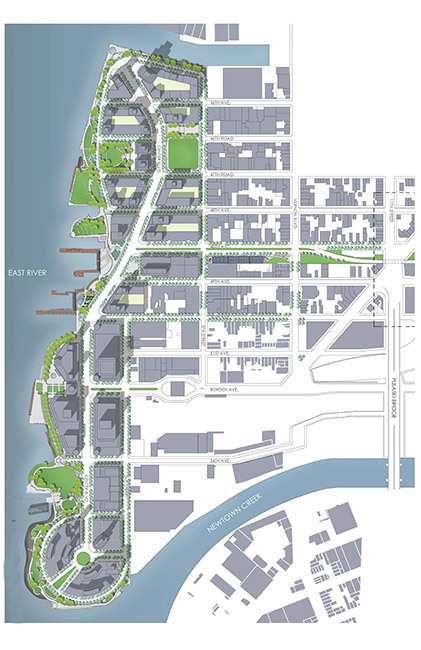 The effort involved urban design, environmental considerations and a highway relocation; and required a creative, yet pragmatic, approach that was responsive to intractable timetables, multi-agency comments, community participation, and client objectives. 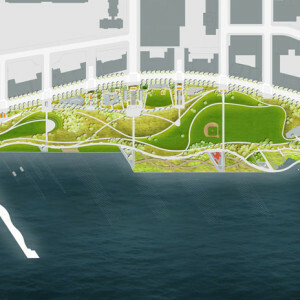 The park plan provides a unique opportunity for the city’s westside residents to walk unobstructed through the park to the river. 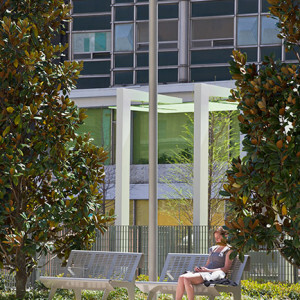 Park entry enclaves are enriched with sculptural elements, park portals and pavilions and offer accessible street level seating areas with dramatic views. 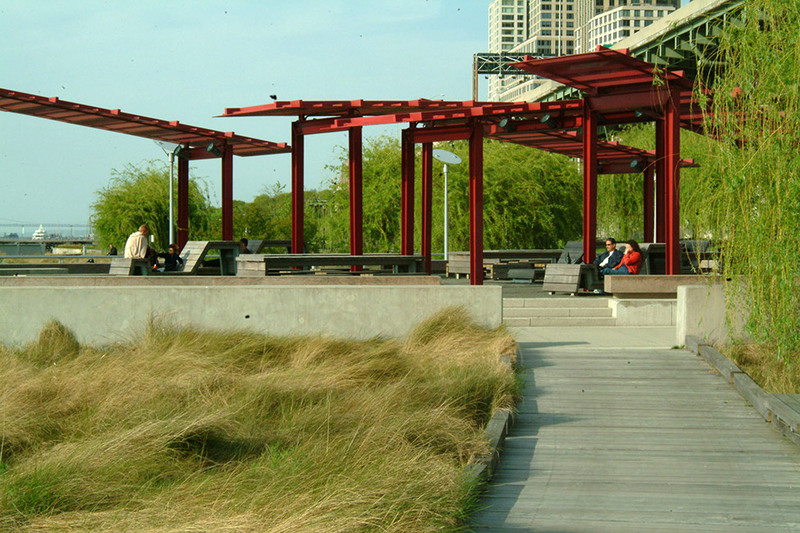 Esplanades, boardwalks, marsh grasses, piers and intimate coves provide a variety of water edge experiences. 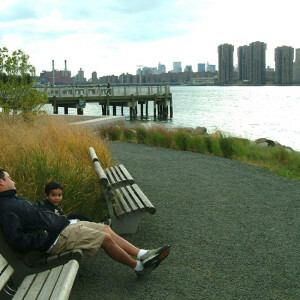 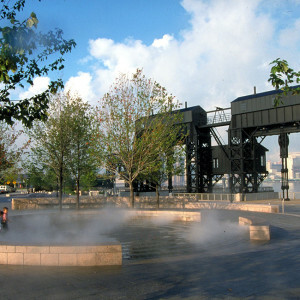 A sensitive balance of active and passive recreational opportunities such as game counts, ball fields, community gardens, interpretive stations, play areas, cafe terraces, public art, a turf amphitheater and open lawns reflects the diversity of New York City and its culture of recreation. 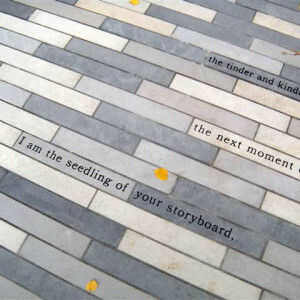 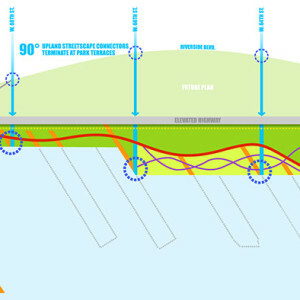 The design draws upon the tradition of Olmsted’s Riverside Park to the north and celebrates the site’s history by infusing both with a 21st century park experience. 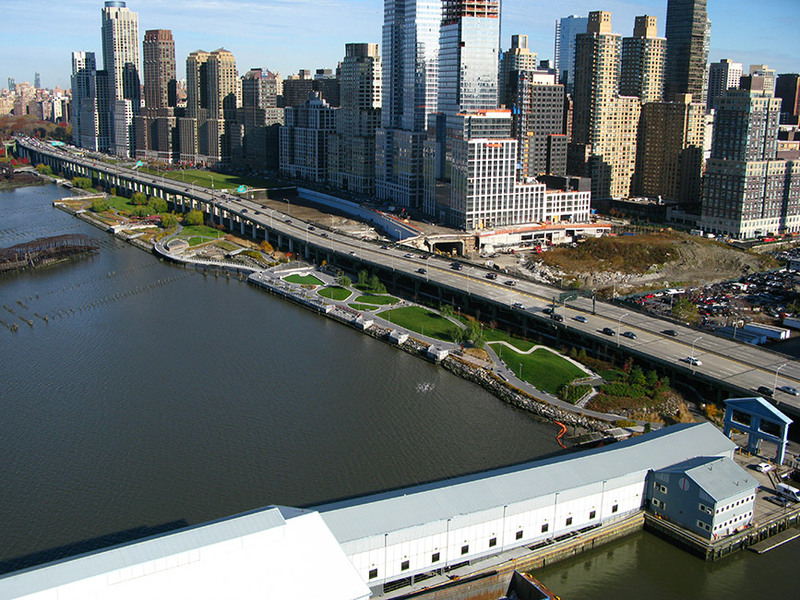 On the West Side of Manhattan, on the scenic Hudson River shoreline, Riverside Park South is a massive, multi-phase project of sweeping ambition and historic scope. 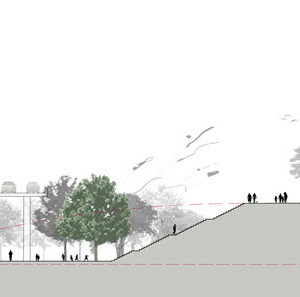 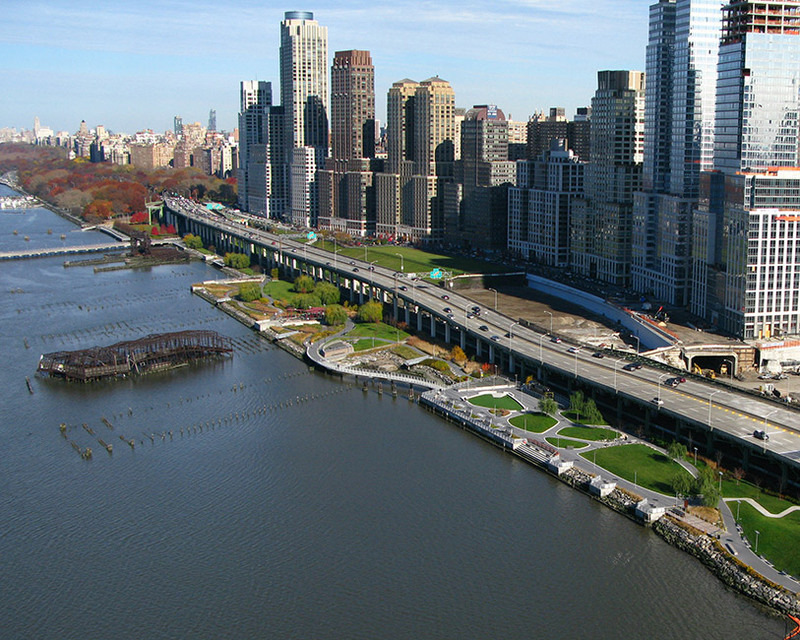 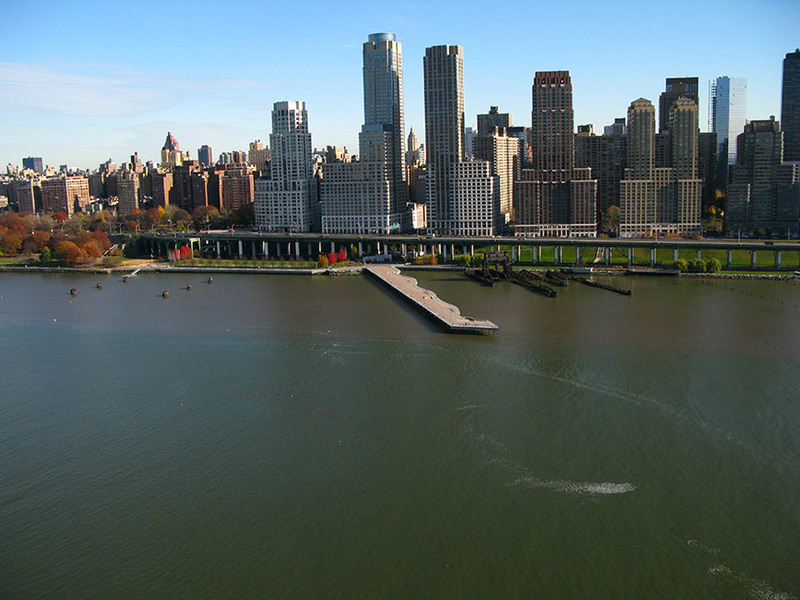 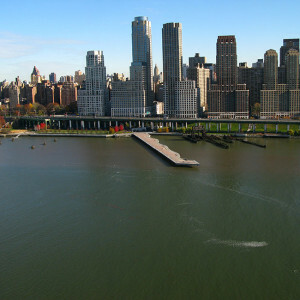 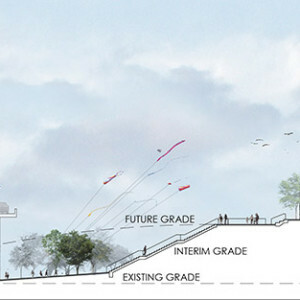 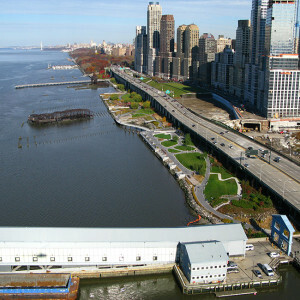 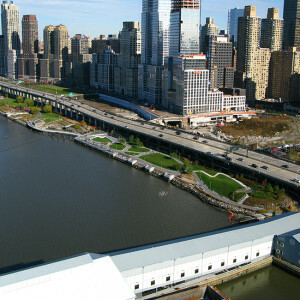 Combining new greenspace, new infrastructure, and the renovation of landmark industrial buildings, the plan—originally devised by Thomas Balsley Associates in 1991—is an extension of Frederick Law Olmsted’s famed Riverside Park, carrying it a further thirteen blocks beyond its traditional southern boundary. 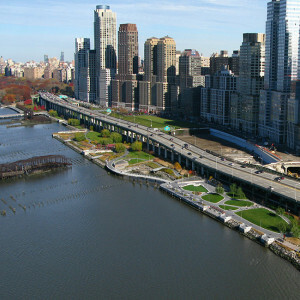 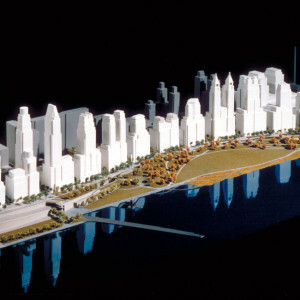 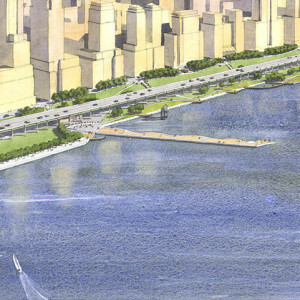 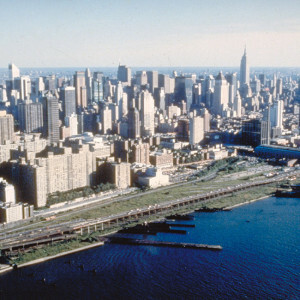 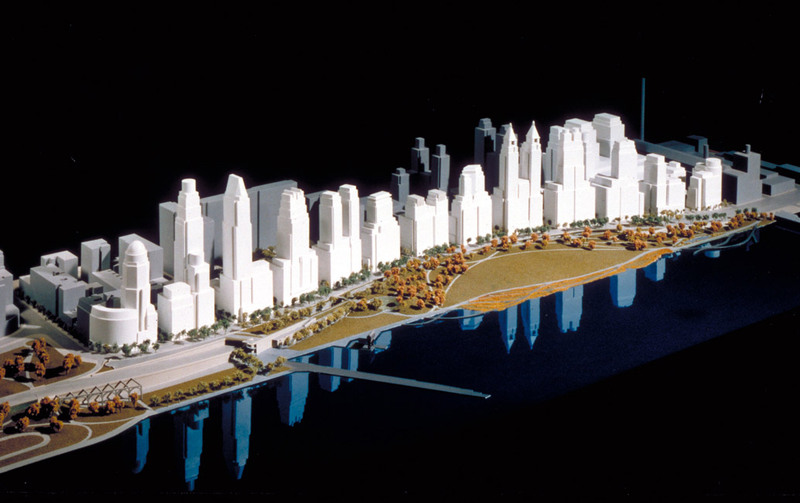 At the same time, the scheme calls for the elevated Miller Highway, long a barrier between the city and its waterfront, to be replaced by an underground tunnel topped by lawns and surface streets, affording unimpeded access from new high-rise apartment buildings and upland neighborhoods to the parks and paths along the river. 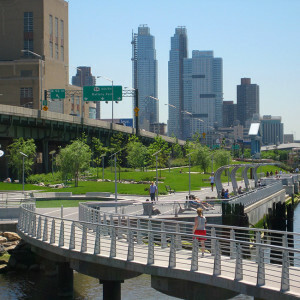 The product of a unique partnership between private developers and municipal government, Thomas Balsley Associate’s design balances the needs of local community members, regulatory agencies, and the natural environment. 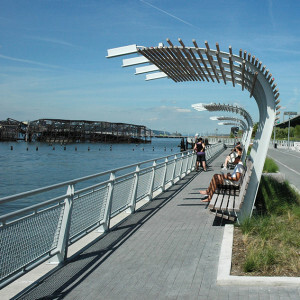 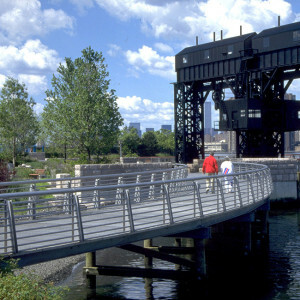 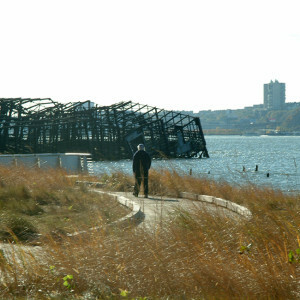 Century-old pier structures and gantry towers, paying homage to New York’s maritime past, become part of a dynamic scenography that includes a network of boardwalks, esplanades, paved paths, and planted margins, all of it giving the visitor the chance to rediscover the Hudson in encounters that range from the intimate to the urbane, the lyrical to the theatrical.